Please note due to a high demand certain dates are booked to capacity for the On-Call Household Cleanup Service. Please be aware that the dates displayed will be the first available for your selected property. Wollongong City Council provides its residents with an On-Call Household Cleanup Service. Residents must book a service prior to placing items on the kerbside and premises are entitled to two (2) collections each Financial Year. Your booked On-Call Household Cleanup will take place on your next Bin Collection Day, provided the booking was made no less than two (2) full business days in advance. For example, to make a booking for a Thursday collection you must book by the previous Monday otherwise the collection will occur the following week. In peak times there may be some delay and the next available collection date could be up to four (4) weeks. Please note certain dates may not present for valid Cleanup booking selection. This is due to maximum demand being reached for that day in your collection area. To ensure you don't miss out, book in advance as there are limited bookings available. Your On-Call Household Cleanup allocation expires at 5:00 p.m. on the 30th of June each year and is based on the date of the service, not the date the booking was made. Unused Cleanup allocations can NOT be transferred to the next financial year and booked Cleanups cannot be cancelled. Residents living in a multi-unit complex (townhouses, villas, units etc.) 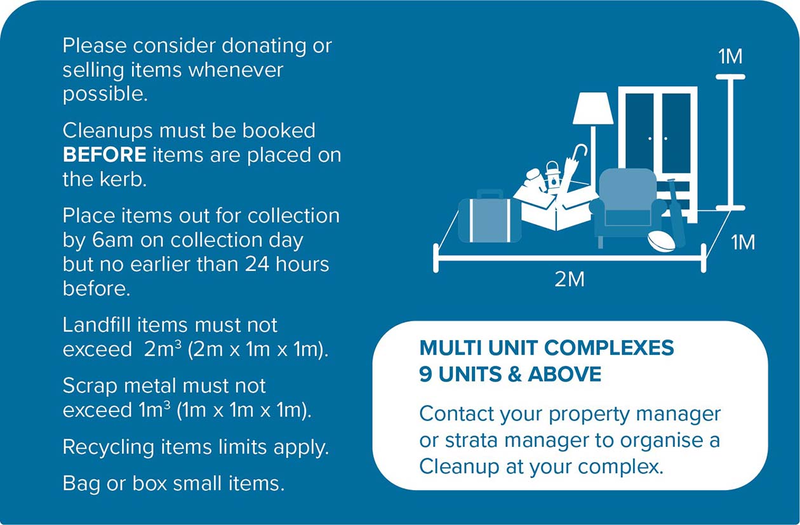 with nine (9) or more units will need to contact their managing body (Body Corporate, Strata Manager or Department of Housing NSW Officer) to organise a Cleanup for their complex. Once the Cleanup has been confirmed by REMONDIS Harbour Cities, the managing body will need to notify residents of the collection date. If there are eight (8) units or less in your complex you can book a collection service directly with the REMONDIS Harbour Cities Team. Cleanup Recycling items to be neatly placed in a separate pile next to your Cleanup waste items. These items are in addition to the two cubic metres (2m3) allowance but do have restrictions. Refer below for further details. Do not place items out that are unsuitable for collection. They will not be collected. Fines may apply. Check your Cleanup Ruler in your waste pack for what you can and cannot place out for collection. Important: Ensure there is at least 1 metre of space between your Household Cleanup items and your Bins placed out for collection and there are no cars, trees, power lines or obstacles blocking access to your collection items. Placed securely so they won’t fall or blow onto the roadway or footpath. Maximum quantity 1m3. Less than 2m in length. Items must contain at least 70% metal. 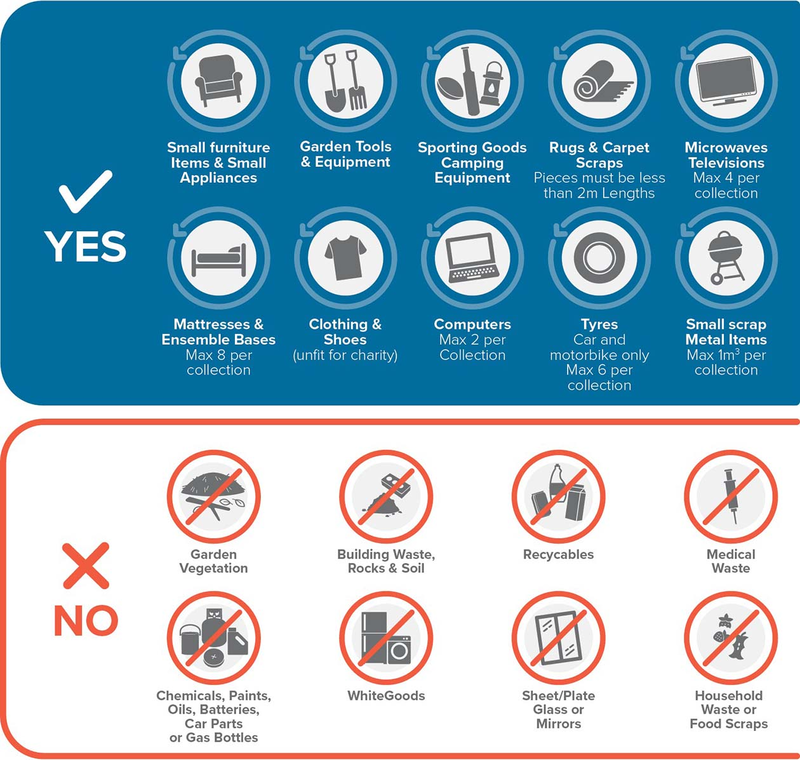 Cleanup Waste Items – Maximum 2m3 per collection. General Household items piled neatly, with small items in unwanted boxes or bags on the kerbside. IMPORTANT: These items will NOT be collected if presented. It is the responsibility of the resident to dispose of these items correctly at a licensed waste management facility. Fees and charges may apply. What can I do with materials that are NOT accepted in the Cleanup? To print an On-Call Household Cleanup Service guide click here.